Welcome to the Canopy Family! Do you have a question for our team? Check below to see if we’ve answered it for you. If not, feel free to contact us for more information about your next trip! What is the best time of year to visit Panama for birding? The best time for birdwatching holidays depends on your interests, as there’s always something interesting going on in the forest. For example, if you visit us from early December to mid-January you will see the forest still lush and green as the rainy season has just ended. Some northern migrants are present as well as the resident species. The days are sunny and balmy. January, February and March is our “high season”, there is a lot of sun and practically no rain (bring sun block), the birding is continuous from sunrise to sunset and, occasionally, into the evenings to look for owls and potoos. In mid-March to early May you’ll find yourself in the middle of spring migration, a great time to see many different warblers and other Neotropical migratory birds in fresh breeding plumage, as well as hundreds of thousands of raptors on their way north. In May and June it is the start of the rainy season, and many resident birds will be starting to nest and vocalize more often. From June to August you will see the forest at its lushest, there is plenty of food out there and you will see immature birds being fed by their parents. There is usually a tropical shower in the early afternoon, “siesta” time anyway. After the shower the sun comes out, birding is restarted and life continues on. The nights are clear and cool. Migrants are gone, but you’ll find plenty of resident species to keep you distracted. Our prices are heavily discounted at this time of the year because many of our customers prefer to come to the tropics during the winter months to escape the cold, so demand is slower. In September we start getting the first fall migrants, and this number climbs and reaches its climax around the middle of October and extending until the first week of November. This is the fall migration, a fantastic natural phenomenon when hundreds of thousands of raptors fly over the lodges (best seen at the Canopy Tower and Canopy Camp) on the way to their southern wintering grounds. This is one of the most impressive natural spectacles of Neotropical birding. It is comfortable and there is almost always a breeze. The temperature often drops into the mid or low 70’s (F), and many people wear light sweaters in the evenings. Furthermore, every room has large windows and fans to enhance natural ventilation. Air-handlers on air conditioning systems are notoriously noisy. We want you to be able to hear the sounds of the rainforest, the howls of the howler monkeys, the hoots of the owls, and the songs of birds, not the hum and growl of technology. Air conditioning consumes lots of electricity. Fifty percent of electric power in Panama comes from thermoelectric plants burning tons of oil and producing tons of pollution. In planning the Canopy Family lodges, Raúl made many decisions, including this one, in favor of continuing diverse life on the planet. We hope you’ll agree that he made the right choice. Is there a way to reach the outside world during my stay? We have Wi-Fi internet available at all of the lodges. 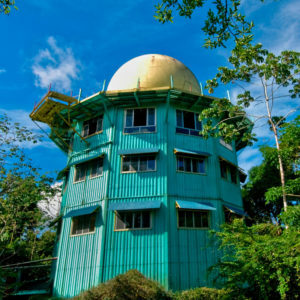 It is strongest and available in all the guest rooms at the Canopy Tower; at the Canopy Lodge and Canopy Camp the connection is slower and it is only in the common areas. If you need to make a phone call, we are happy to help you with your call via landlines (bring a long-distance calling card) or Skype. Do you offer transportation to nearby birding spots, or do I need to rent a car? Yes, we offer transportation to nearby birding spots. Transportation is included in our Birding Packages and our A La Carte Tours. If you are interested in visiting birding locations on your own, we can provide transportation as well. Contact us for rates. It is not necessary to rent a car. Are airport transfers included in a stay at the Canopy Family lodges? Please find information below regarding our transfers. Our all-inclusive birding and nature packages include transfers in and out of the Canopy Tower, Canopy Lodge and Canopy Camp. We will also gladly arrange transfers to guests without a package at an additional cost. Due to logistical reasons (heavy traffic entering and exiting the city), we have implemented scheduled airport transfers. We will gladly arrange private transfers at different times. Keep in mind that private transfers carry an additional cost and that transit time can vary greatly depending on traffic. It takes approximately 1 hour to reach the airport and you should be there 2 1/2 hours before flight departure. Please book your flight accordingly. It takes approximately 2 1/2 hours to reach the airport and you should be there 2 1/2 hours before departure. Please book your flight accordingly. 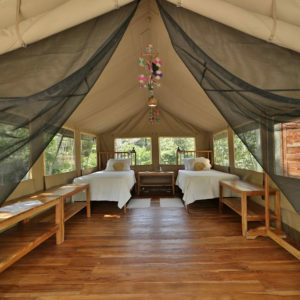 Transfers to the Canopy Camp are provided on the first and last day of the tour package. Please plan to arrive by the night before the tour starts and depart after 6 pm on the last day of the tour. The returning transfer arrives in Panama City at 4 pm on the final day of the tour. In all cases, please book your flight accordingly. When doing so, please take into account that immigration and customs can take anywhere from 30 minutes to an hour in most cases. Don’t worry, we won’t leave you stranded but please remember that there may be other guests waiting. Please contact us if you have any questions. We will gladly arrange private transfers at different times. Keep in mind that private transfers carry an additional cost and that transit time can vary greatly depending on traffic. – The earliest private transfer out of the CT is at 6:30 am. – The latest private transfer into the CT is at 7:30 pm. Thank you for your understanding. Please contact us if you have any questions regarding transfers to our lodges. US and Canadian citizens need only a valid passport. Other nationalities please consult the nearest Panamanian Consular office. Your passport MUST HAVE at least 6 months validity remaining from your return date home. For safety and overall enjoyment at the Canopy Family lodges, we accept children 13 years and older to stay. However, we do encourage birding and nature among our younger generations and we do make exceptions, so if you are traveling as a family and would like to stay with us, please contact us for more information. What is your check-in / check-out policy? Check-in time is from Noon to 7:00 pm. Due to the nature of our ecolodges, we do not accept arrivals after 7:00 pm. Please contact us for options regarding late arrivals. Check-out time is 9:00 am. Late check out may be available for an additional fee, and we’ll be happy to accommodate our guests given sufficient notice. I’m a vegetarian. Will I go hungry? No way! We serve plenty of fresh fruit and vegetables, lots of salads, plenty of nuts, and several veggie dishes made with “tofu”, soy products and other ingredients. No problem satisfying your appetite, but please tell us when you make the reservation so we’ll be prepared. We do our very best to accommodate any dietary restrictions or conditions/allergies. 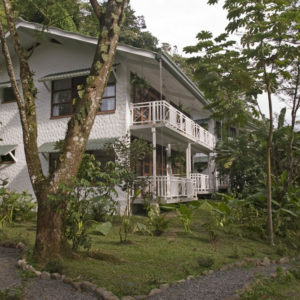 The Canopy Family lodges offer family-style dining with a delightful blend of Panamanian and American fare. There is always a hearty protein option with vegetables, salads and local specialties. Don’t forget to save room for dessert! What is your suggestion regarding tipping? You may tip as much as you want — the more the better! However, a rule of thumb is between $5 and $10 per day for lodge staff, among whom tips are divided equally. The driver who brings you from the airport or hotel, if he is not wearing a Canopy Tower shirt, is an independent contractor and does not share on the tips left for the staff. You may tip him directly — US $5 will be considered a good tip. Likewise, our bird guides are tipped individually. How much? We recommend $10 per person per day. However, it depends entirely on you. Obviously if they show you 75 “lifers” in a week or find you THE bird for which you have been looking for several years, you’d be inclined to be generous. Please give your tip directly to the guide. By recognizing their dedication, enthusiasm and knowledge, we can encourage our bird guides to be real professionals. To learn more, call us at 1.800.616.7451 or email contactus@canopytower.com. We look forward to hearing from you!